The OpenGL version supports more controllers than the DirectX version, including DualShock 4. Windows users can manually switch to the OpenGL version. No resolution option ingame, only Adjust Screen Size option for scaling to fit your screen and resolution. Game capped at 60 fps. 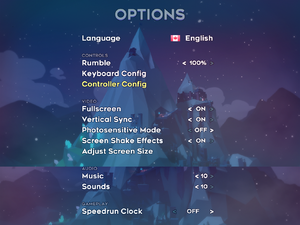 Menus are uncapped. Windows defaults to DirectX version of the game. The OpenGL version is available as an optional public branch in Steam. The OpenGL version of the game runs on FNA and SDL2, which has more controller support than XNA (DirectX). 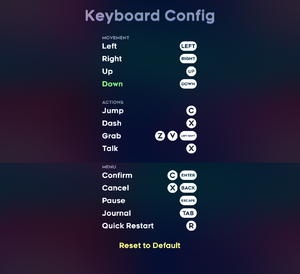 Select the game, Right-click on it and select Properties. Change Select the beta you would like to opt into to opengl - and click Close. Play the game after the download have finished. Windows users must switch to the OpenGL version of the game, or enable DualShock 4 Support in Steam. Can be reduced or disabled. OpenGL version uses FNA and SDL2. DirectX version uses XNA. 9 Default version on Windows. 2.1, 3.0 Linux/Mac. Available on Windows as a separate branch in Steam. Windows uses a 32-bit executable. 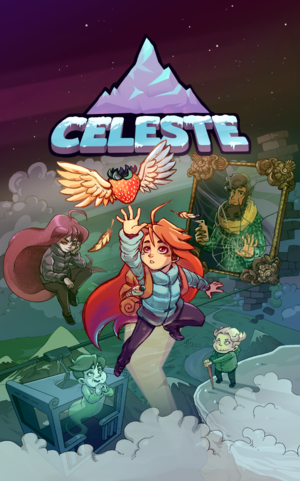 "Alternatively you can use the OpenGL Beta branch (by changing it in Celeste's Steam settings by right clicking the app). 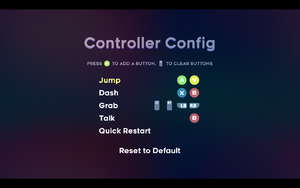 The OpenGL version of the game runs on FNA & SDL2, which has more controller support than XNA."